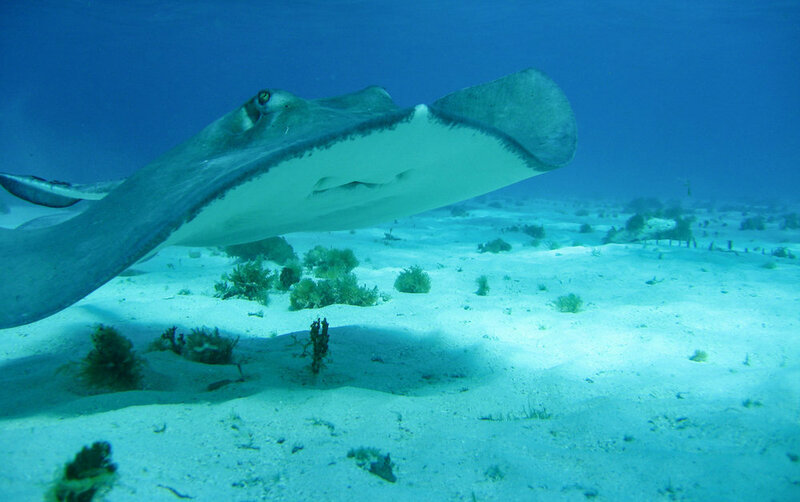 One of the more unusual highlights of a trip to Cayman is the chance to snorkel Stingray City. Cozy up to one of the planet's most fascinating creatures - the Southern stingray. The water is shallow and crystal clear, making it suitable for everyone. History has it that returning fishermen would stop here to clean their catch. The castoffs soon attracted these loveable creatures and today the sand bar has become a favourite stop-off as they cruise the ocean floor. Read our FAQ guide below to learn how to interact with these magnificent animals in a safe and enjoyable environment. Stingray City is located in waist high water on the North Sound Sand Bar. 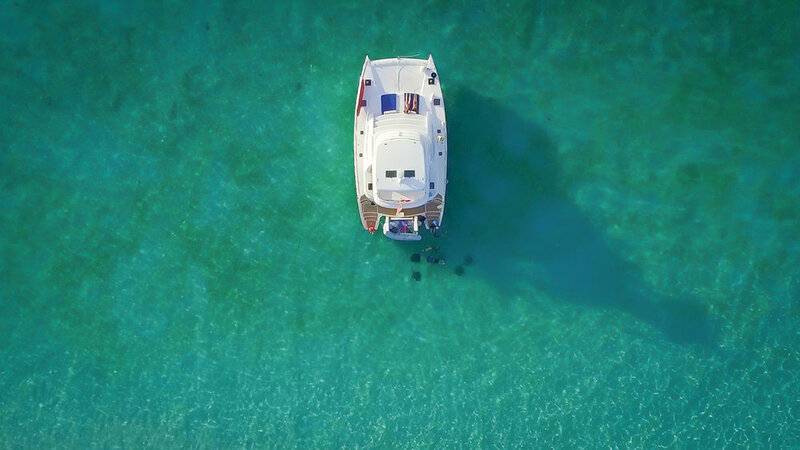 Tour operators and private charters depart daily from Camana Bay or the Cayman Islands Yacht Club. To book your stingray city experience take a look at our approved tour partner list. Stingray City is perfectly safe so long as you go with a professional registered tour operator. 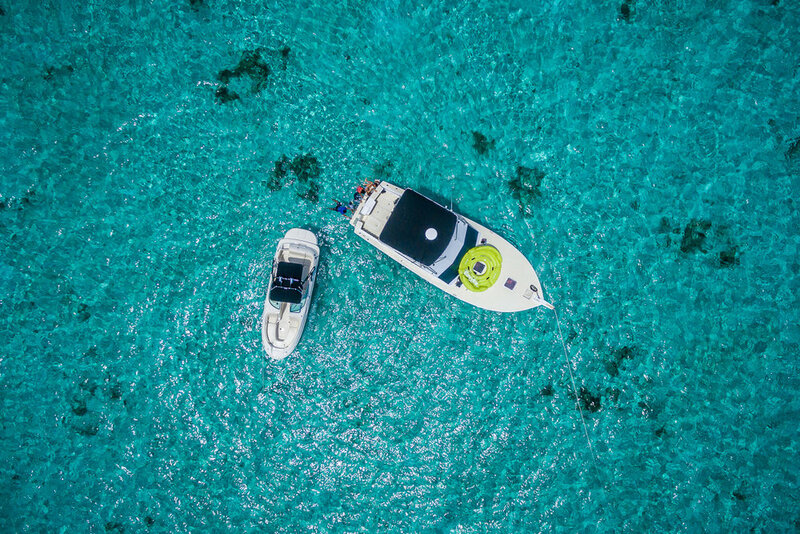 Thousands of people visit the sandbar at Stingray City in Grand Cayman every year, and as long as you follow a few simple rules it’s almost impossible to run in to any problems. Rule #1 - Stay Calm. Stingray are very perceptive to human emotions. If you’re calm in the water, the Sting Ray will be calm around you. Rule #2 - Look where you step. Before you enter the water be sure to make sure there are no Stingray. Stingray like to burrow in the sand to find shelter and to sleep so be vigilant with where you put your feet and don’t step on them. Rule #3 - Don’t jump in to the water. Enter the water calmly, carefully looking to avoid startling the Stingray. Rule #4 - Feed the Stingray carefully. Stingray mouths have ‘plates’ of teeth which they use to grind their food. They also use a sucking motion to channel food in to their mouths. If you feed the Stingray (use squid or ballyhoo) hold the food and make a tight fist tucking your thumb behind your fingers. Hold the food out to the stingray and let them take it carefully avoiding your fingers and thumbs. The water at Stingray City is usually waist high. On calm days it’s easy to see clearly. Occasionally the seas can get choppy and there are parts of the sandbar where you won’t be able to stand up. If you go on a tour, use a certified tour operator who will take you to the best spots where you will be able to stand up and interact with these beautiful creatures in a safe environment. 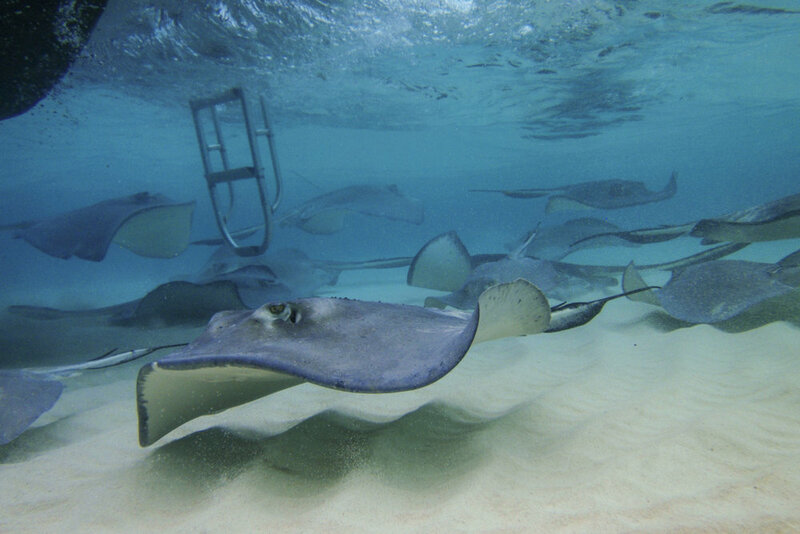 WHERE CAN YOU SWIM WITH STINGRAYS IN STINGRAY CITY? 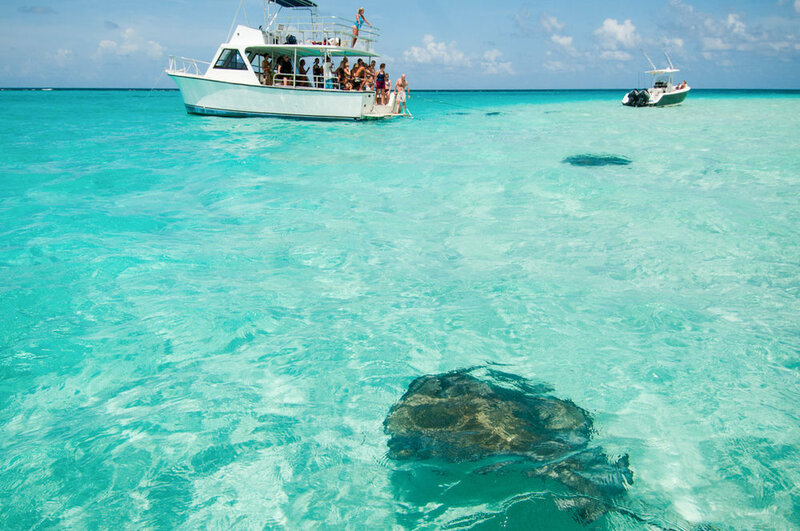 Stingray City ‘Sandbar’ is in the North Sound of Grand Cayman. The sandbar is around 4-foot deep, meaning it’s shallow enough to stand while observing the stingrays. The shallow water is ideal for visitors who are not comfortable swimming for long periods of time. The sandbar is sheltered behind a reef. View our map below to see the location. 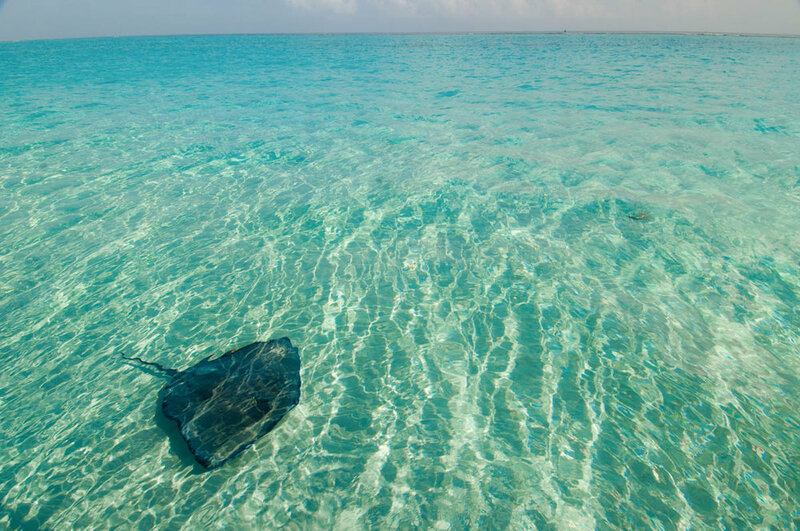 WHERE IS STINGRAY CITY LOCATED? 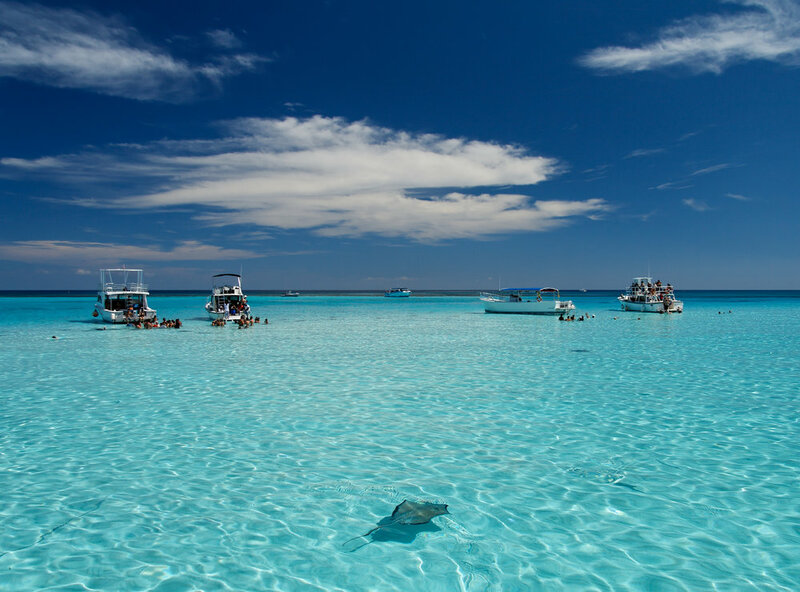 Stingray City ‘Sandbar’ is in the North Sound of Grand Cayman on the North Side of the Island. Although close to shore, it’s not advisable to swim directly to the sandbar. We recommend booking a tour with a reputable tour operator. View our map below to see the location. CAN YOU TOUCH A STINGRAY? Stingray are perfectly safe to touch. They enjoy swimming with people and enjoy being fed squid or ballyhoo. The Stingray have been coming to the sandbar for years and are used to human interaction. The stingray are soft to touch and they feel wonderful. If you’re feeling brave ask your tour operator if you can hold one and they will show you how to do it making for a safe and magical marine life experience.